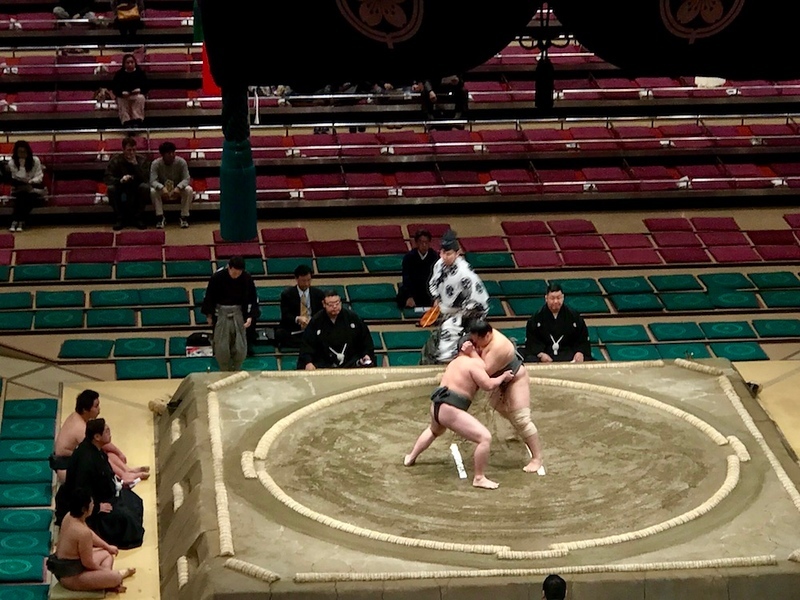 If you’re in town when a sumo tournament is being held, you should definitely try to check it out – it is an unforgettable spectacle. 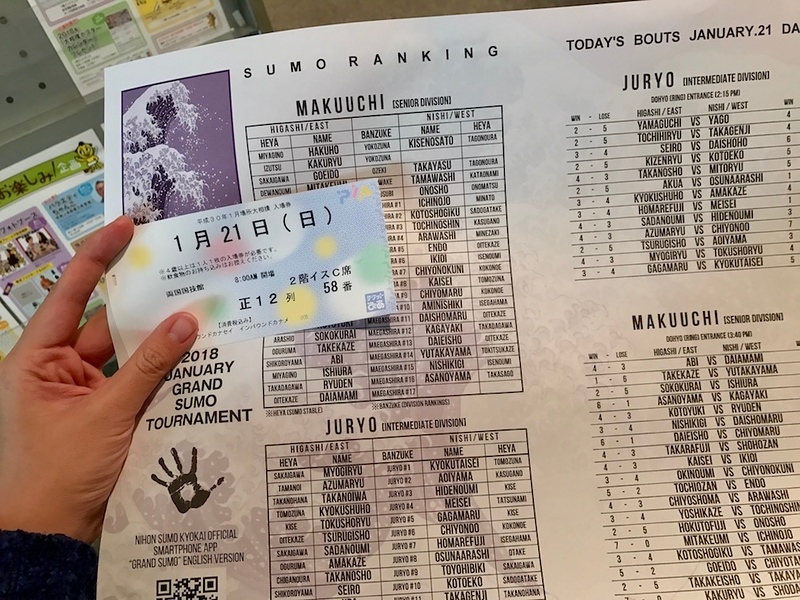 Here is the definitive guide to getting sumo tickets in Tokyo. 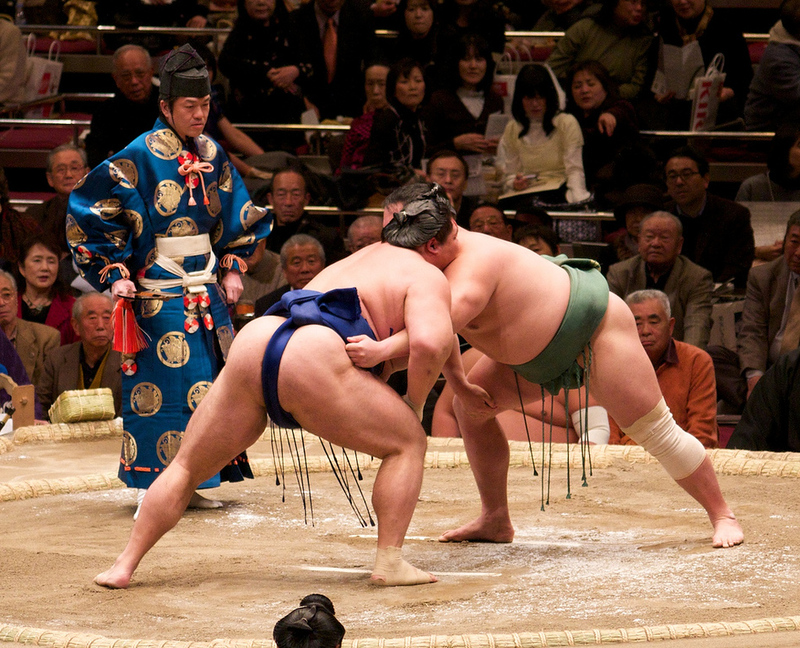 First, check if there will be a sumo tournament (known as a “basho”) being held when you are in town. 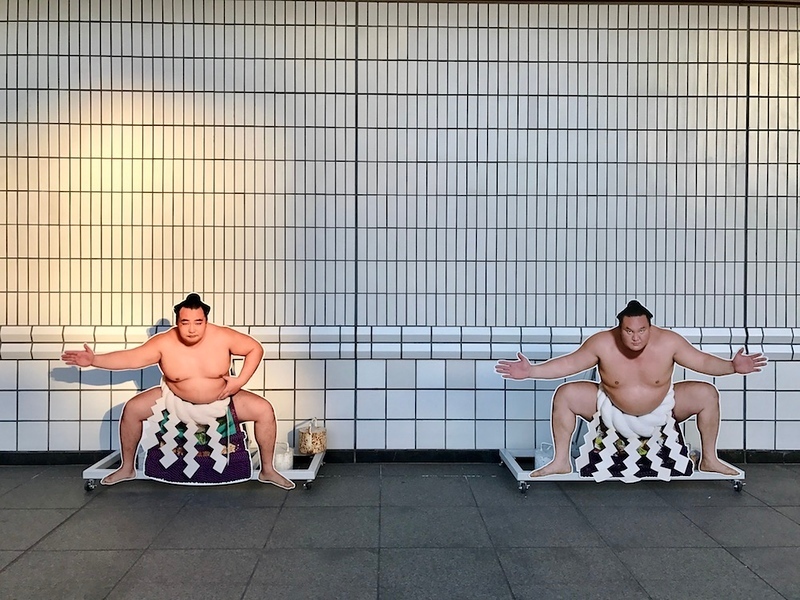 The Japanese Sumo Federation publishes their annual English-language sumo schedule far in advance. 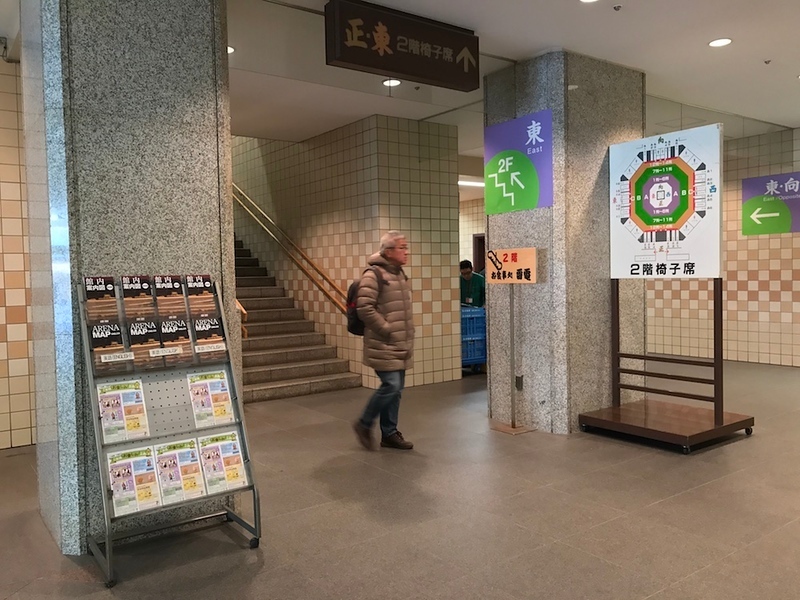 If there is a tournament on while you are in town, there are three main ways to buy sumo tickets: 1) from a Ticket Pia store in Japan, 2) same-day tickets at the stadium, and 3) online from Ticket Oosumo. For most people, buying in advance from Ticket Oosumo is the easiest and most reliable way. But, we don’t always plan ahead. Anyway, I’ll cover each of these in detail here. 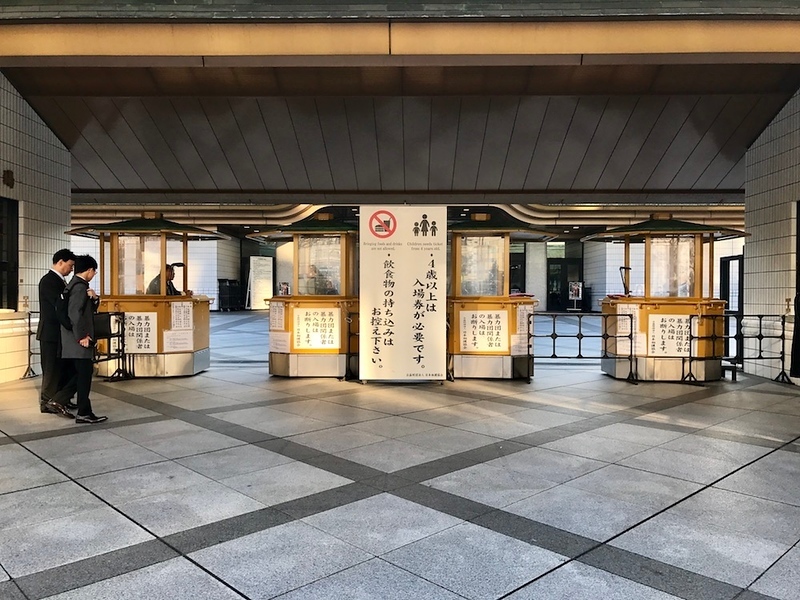 You can also purchase tickets online from GoVoyagin to see the early morning sumo practice sessions in Tokyo which might be a worthy alternative. The practice sessions happen all year round. 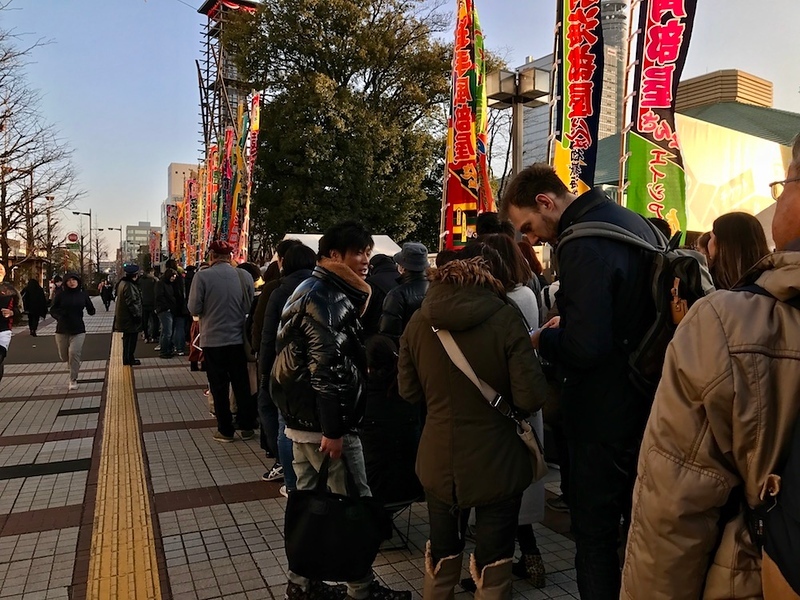 GoVoyagin can also help with Tokyo Sumo Tournament tickets but be aware they cannot always guarantee availability. Read the booking conditions carefully. 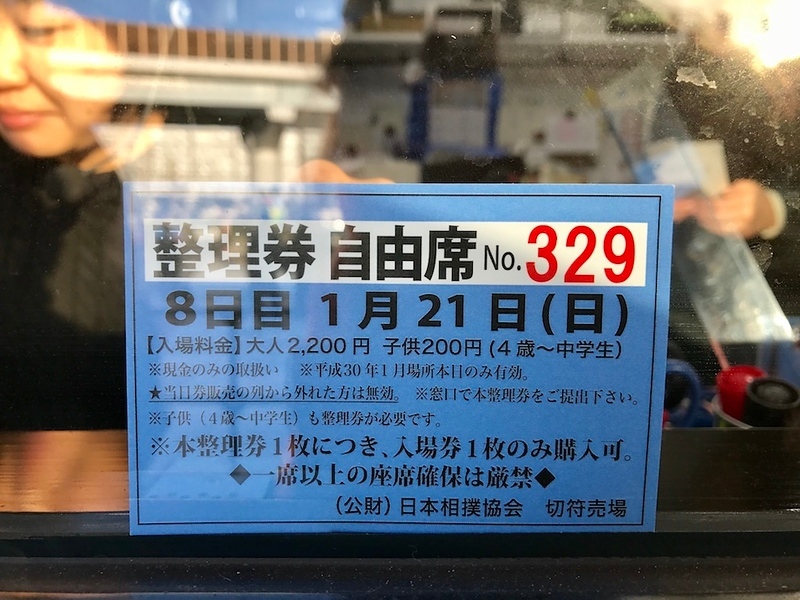 If you happen to be in Japan on the day that tickets to sumo matches go on sale (the sale date is listed on the Sumo Federation website), this may be a good way to purchase one. However, you must be prepared to queue. 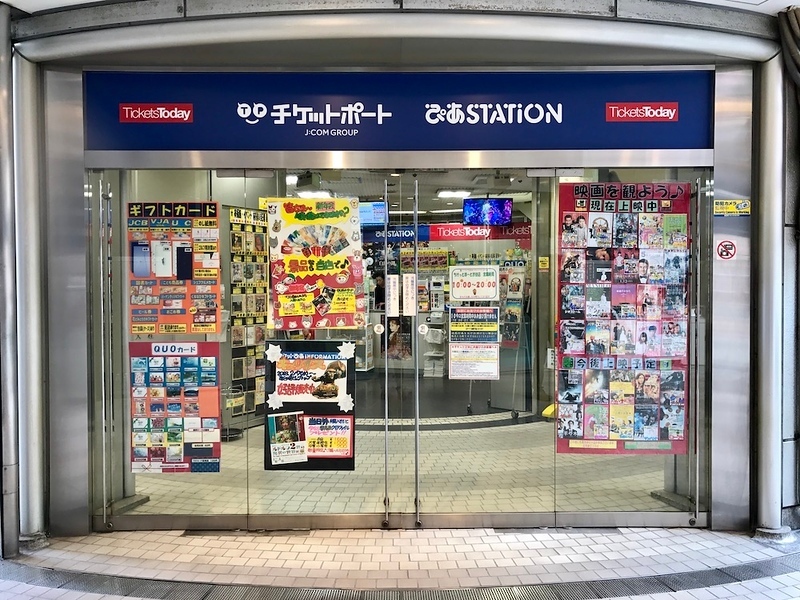 We didn’t manage to purchase one, but talking to the staff at the main Pia office at Shibuya 109 gave us a sense of what’s involved. 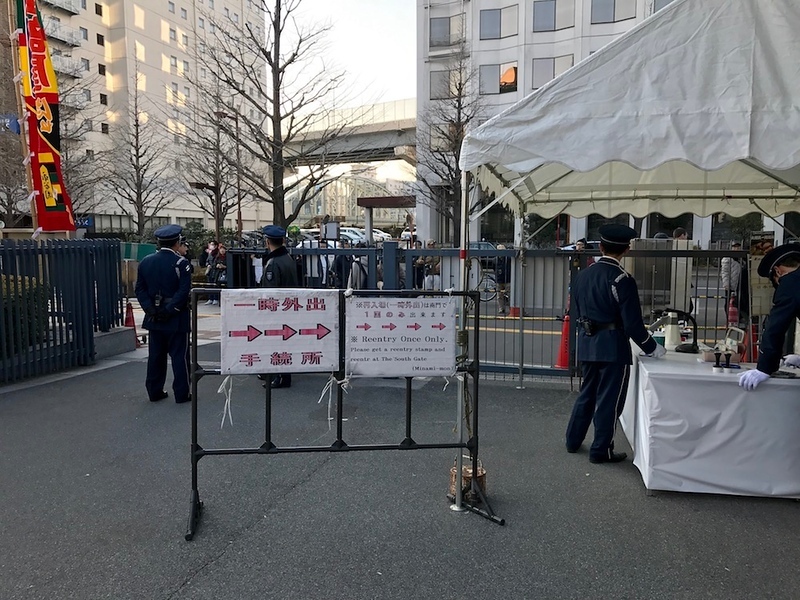 The day before tickets go on sale, die-hard sumo fans queue up outside of the Pia office the night before. At the Shibuya 109 office, this is only permissible after 9pm. (Before 9pm, the security guard will ask you to move elsewhere.) 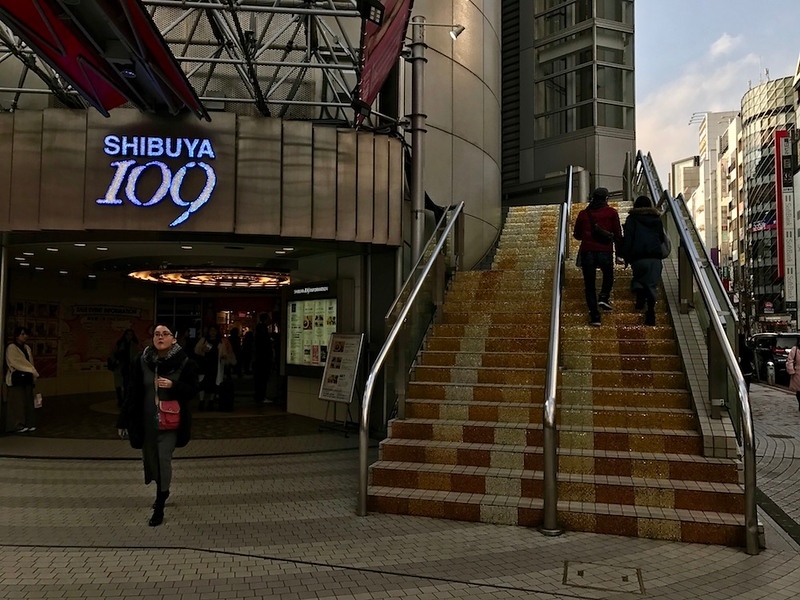 From 9pm onwards, some people do camp out, forming a queue snaking down the stairs to the front of the Shibuya 109 office. 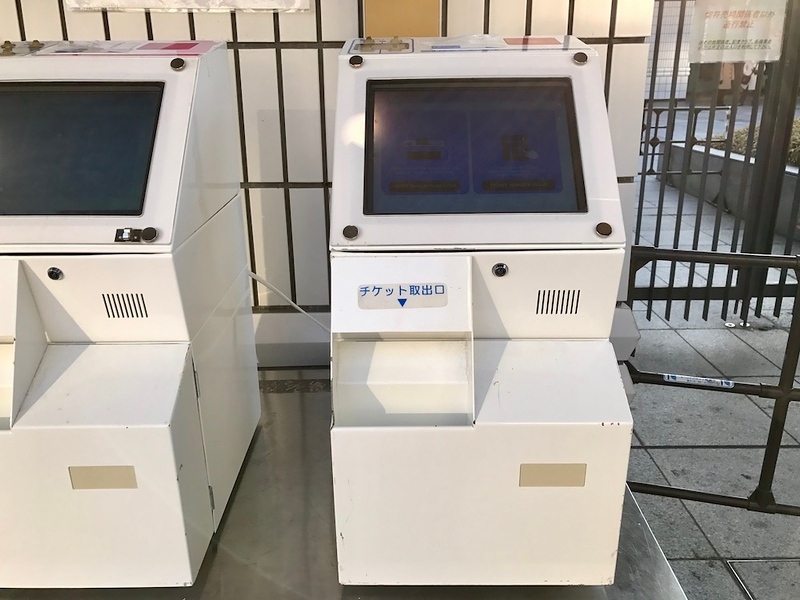 The staff said that people tend to queue in pairs. On the day itself, the staff arrive at the PIA office around 9.30am, and they will distribute forms to people in the queue. These forms look like those in the photo above, and are available in either English of Japanese. You won’t need a booking reference number, telephone number, or ID to buy these tickets, so there’s no need to fill those sections in. The staff will assign a number to each form. When the office opens at 10am, they’ll call you in the order in which you arrived or are standing in line. Then, you can buy your tickets at the counter. As you can probably guess, queuing up at a Pia store won’t guarantee you a ticket. According to staff, all the tickets that go on sale on a given day tend to sell out by around 2pm, if not before. But if you’re in town with some time to spare, there’s no harm trying your luck. 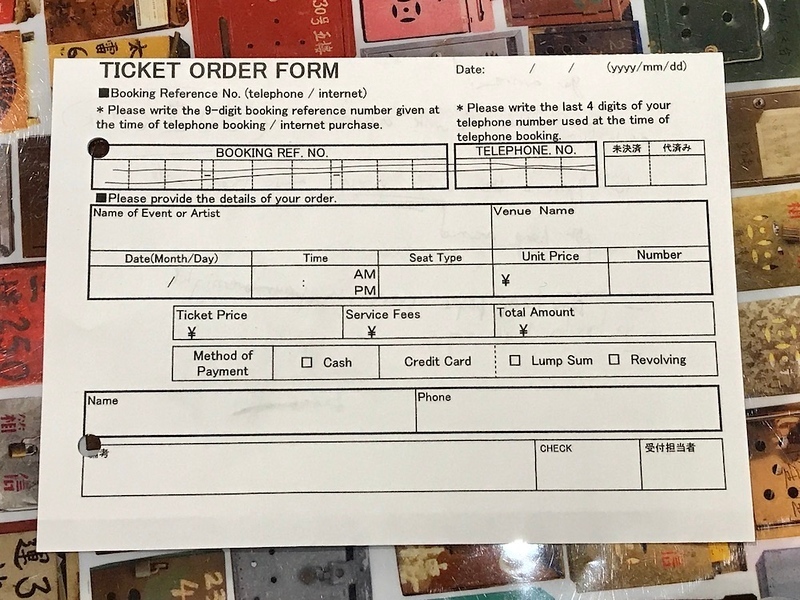 If you weren’t able to purchase a sumo ticket from a PIA office the day they went on sale, or forgot to purchase them online from Ticket Oosumo (see following section), you still have a chance at watching a sumo match. 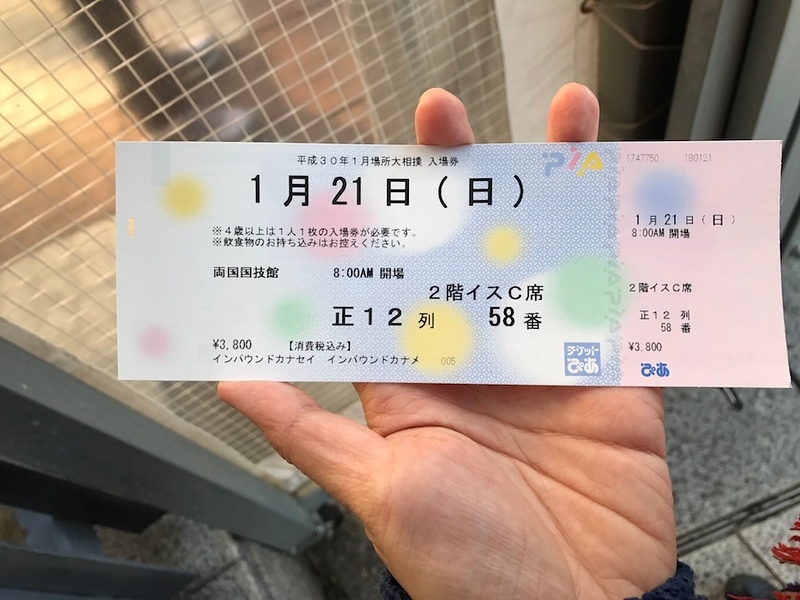 Around 400 same-day tickets are available on the day itself. These tickets are for “free” seats (ie, normal seats, not the nicer box seats closer to the action). 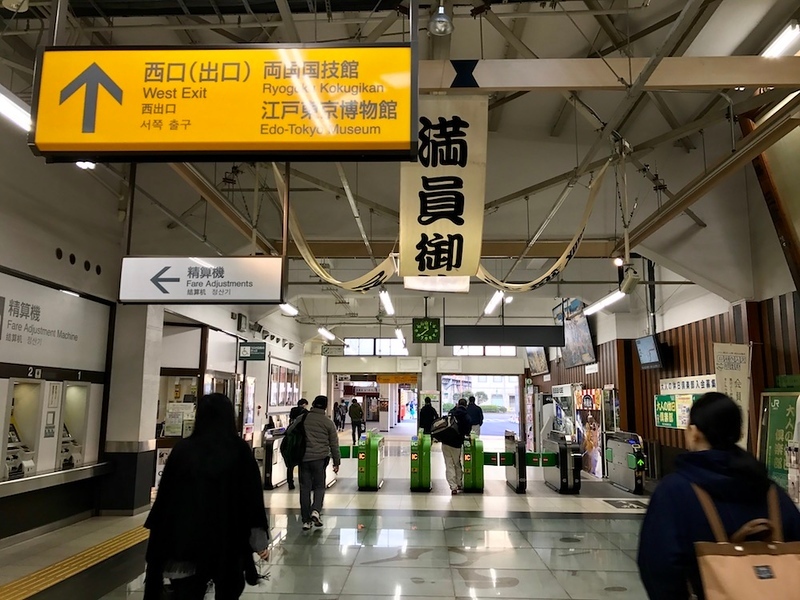 First, take the train to Ryogoku Station on the JR Sobu Line. Head to the West Exit. After exiting from the ticket barriers, turn right. Follow the coloured banners, crossing the road. 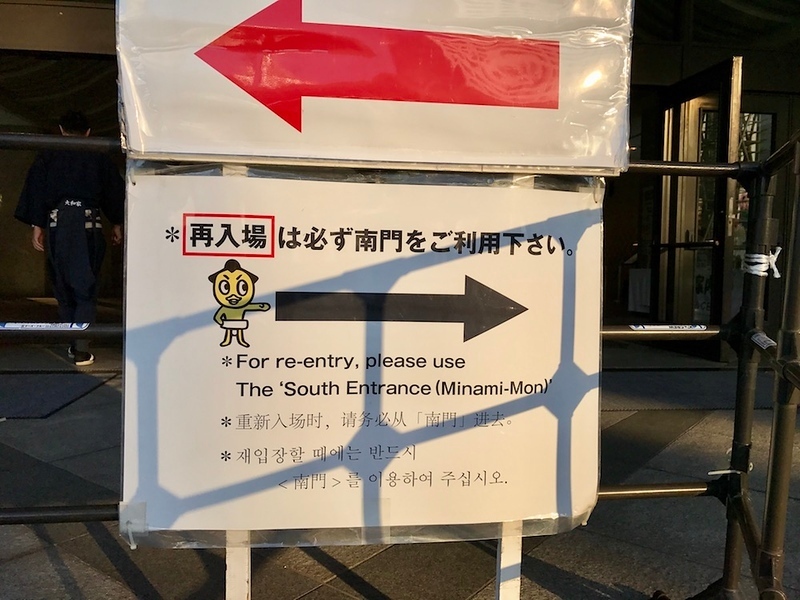 To your right is the entrance to the Edo-Tokyo Museum; turn left, and then right on the corner. If you keep walking straight, you’ll see the box office on your right. However, you’ll want to join the queue. There will most likely be a line of people already there. By the time I arrived at half past seven, the queue was around 384 people strong. I know this because stadium staff handed me a numbered ticket - mine was 385 - when I joined the queue. Hang on to that numbered card, because you’ll need it to purchase a ticket to watch the matches. 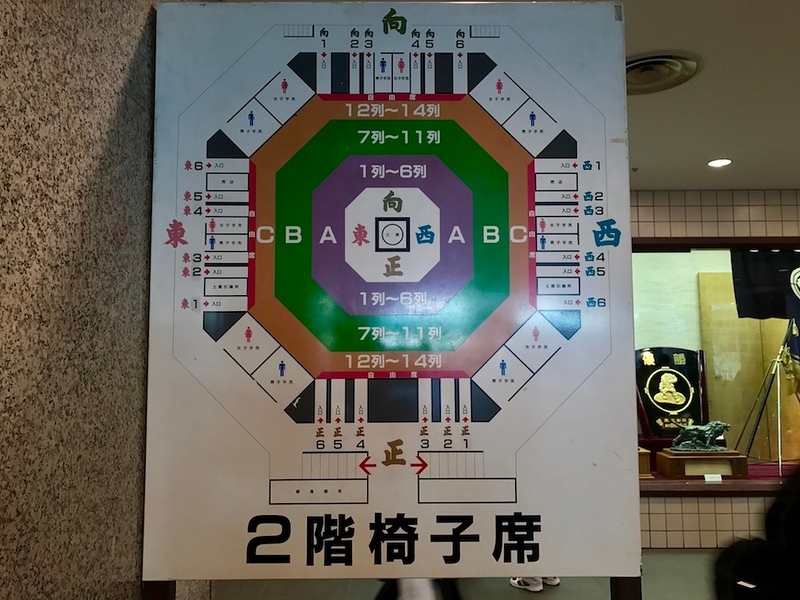 You can only buy one ticket per person, so everyone who wants to see sumo with you must accompany you to the stadium and get their own numbered card. 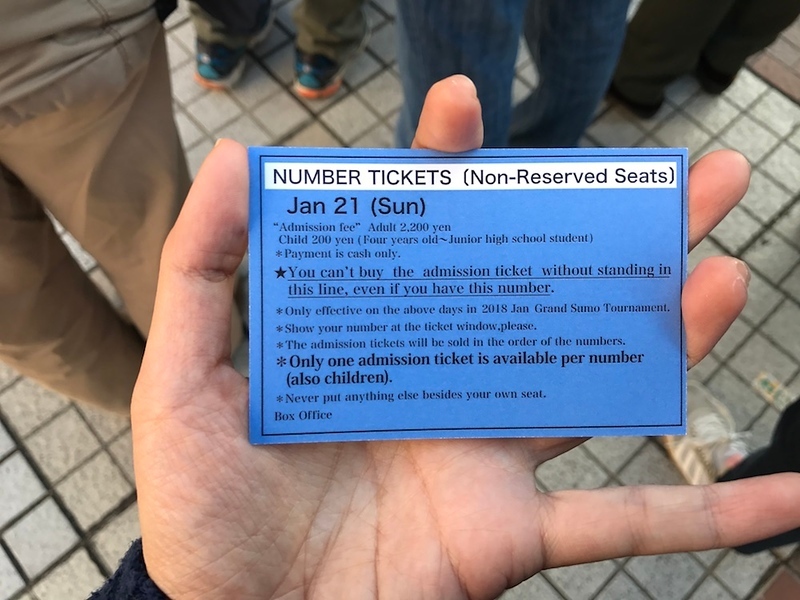 As you can see from the photo above, you need one card per person in order to have a ticket per person. 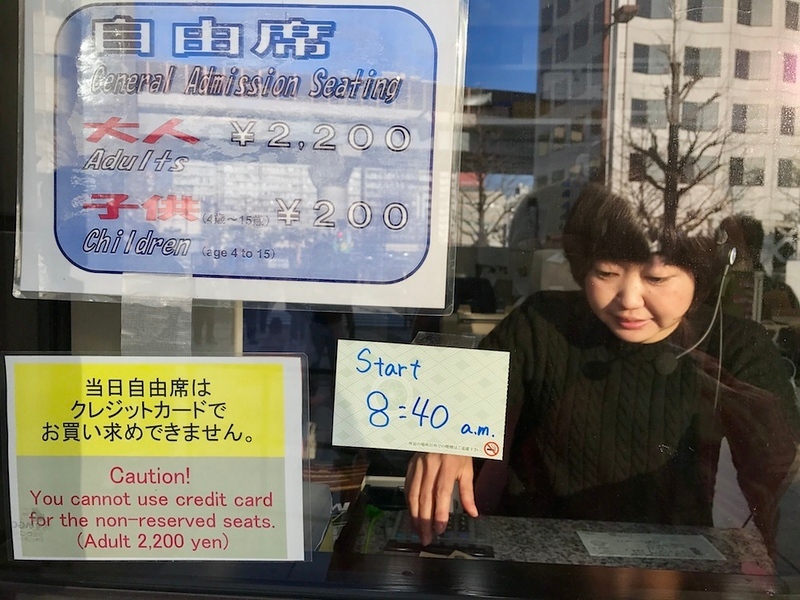 At the box office, I discovered that there are usually only around 400 same-day tickets sold. Even though the box office only opens at 7.45am, people tend to begin queuing much earlier. 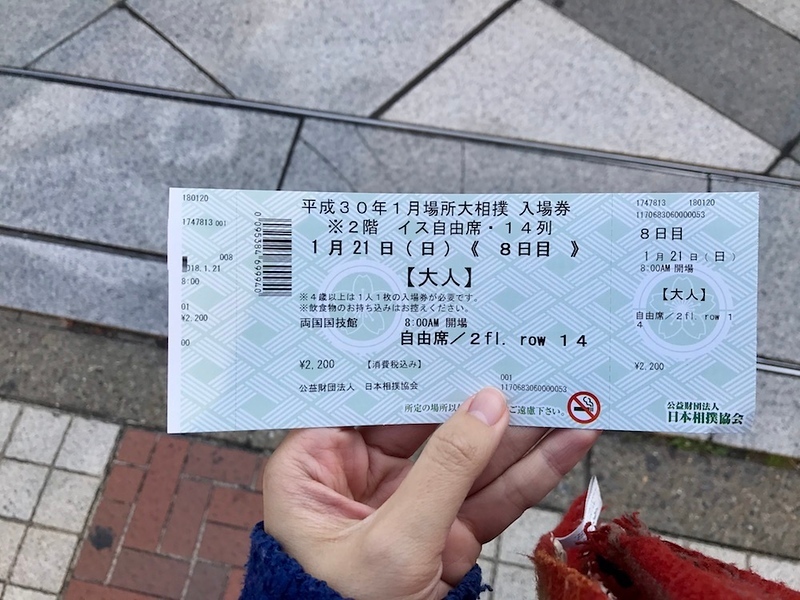 I arrived at 7.30am and just managed to snag a ticket. So, plan on arriving very early - ideally before 7am - to increase your chances of securing a ticket. You’ll need to arrive earliest for weekend matches and matches late in the tournament. The rest of this is a fairly straightforward process. Hand in your numbered cards at the box office, pay JPY2200 per person, and receive your tickets. Credit cards are not accepted. Voila! You’re now ready to watch some matches. You might want to go back to your hotel and rest and then return to the stadium later in the day when the higher ranking wrestlers compete. The best seats are on the shomen (front section). Tamari are the ringside “box” seats. Actually, these are square areas where you sit on the floor. Masu seats are similar but a few rows back. Isu seats are normal stadium seats behind the masu seats (isu means chair in Japanese). Jiyuseki are standing areas behind the isu seats. In the following section, I’ll explain how to pick up your tickets at the stadium. 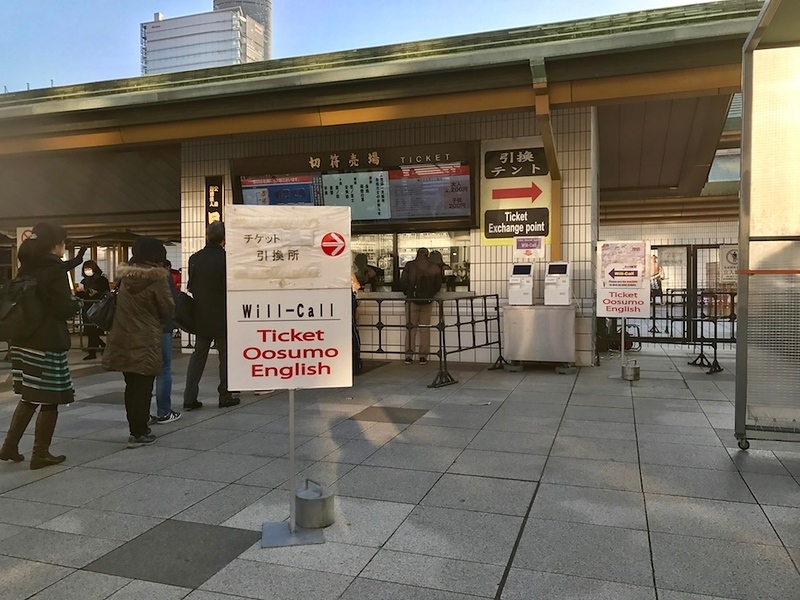 To pick up tickets purchased from Oosumo, you need to visit the box office in front of the stadium. There are white machines next to the ticketing office. There’s large, clear signage in English, and it’s practically unmissable. It’s a basic-looking machine that’s very functional, and very easy to use. You won’t actually need your passport, or even the credit card used for booking, despite the fact that the email you receive from Ticket Oosumo says that you will. Touch the screen to begin. There are two options: entering your credit card number, or ticket number. For the credit card option it says you will have to swipe your card, but this is optional. 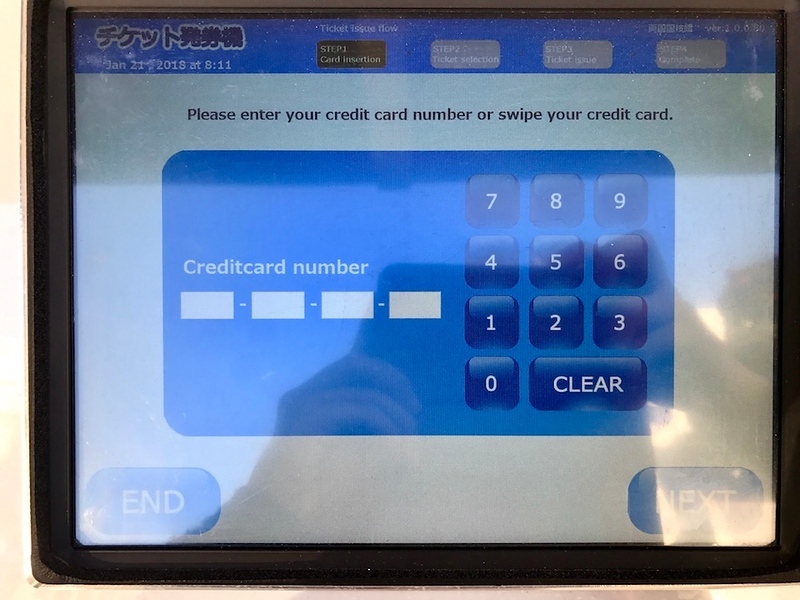 You can simply enter your number on the screen. 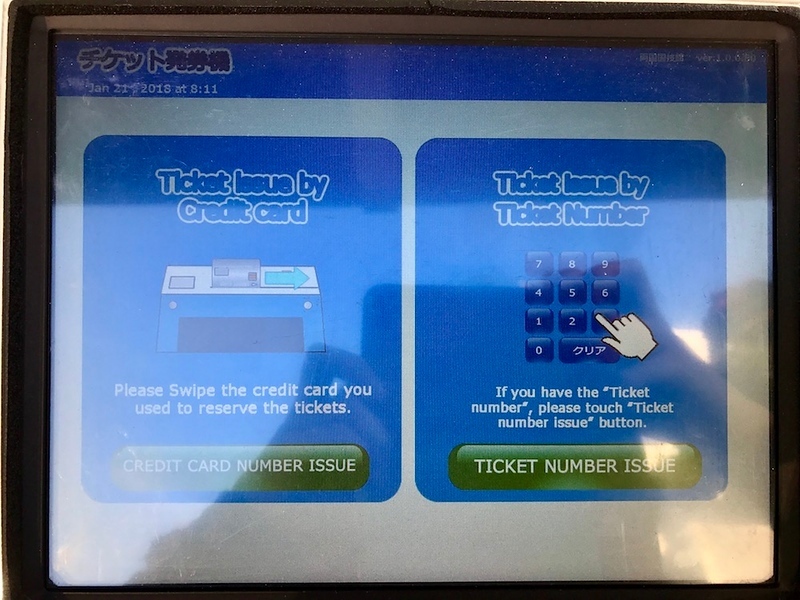 Press the TICKET ISSUE button. 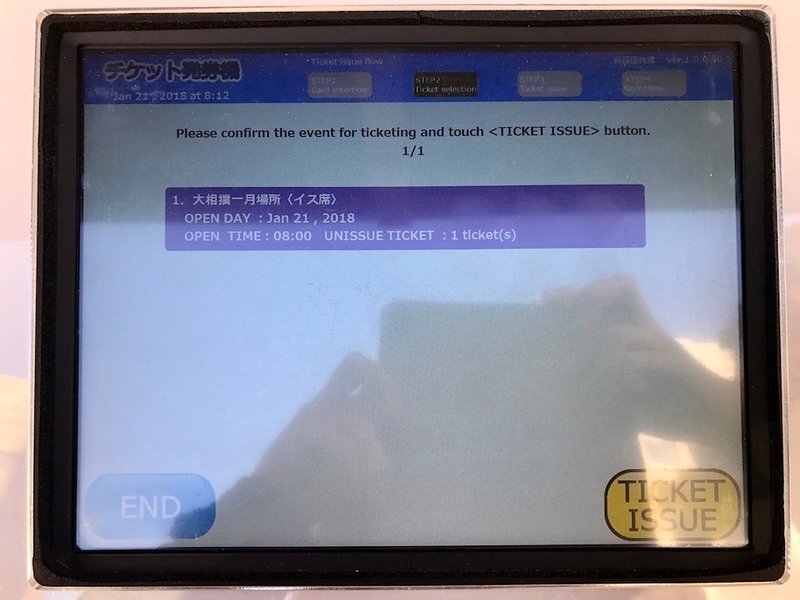 The machine prints your tickets within 15 seconds. Congratulations! You now have your reserved-seat ticket for the sumo matches. The ticket is valid for one re-entry - meaning you can enter, leave the stadium once and re-enter on the same ticket one more time. Not much happens in the morning, and for most of the day. The real action starts around mid-afternoon at 2.15pm. I went inside to scope out the stadium. Show your ticket to the attendants, and they’ll give you an English-language schedule of all the important matches for the day. Inside, there are arena maps available next to the staircases. The seating can seem confusing, but there are also stadium staff milling around, ready to direct you to the right place. Just show them your ticket and they’ll point you to the correct seat. If you’ve purchased a same-day ticket, what you need to know is that the free seating-seats are the topmost rows running the perimeter of the arena. 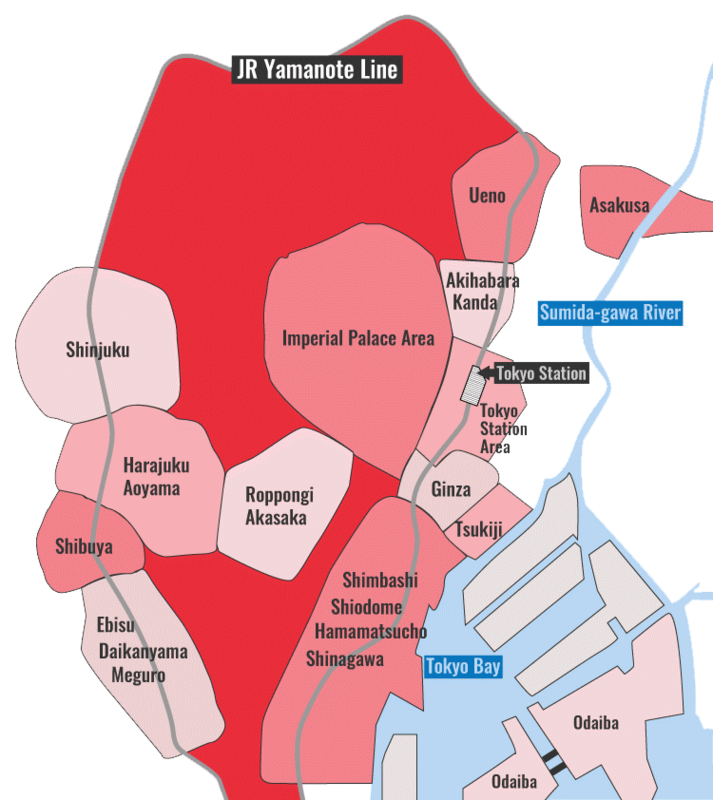 These are marked in red on the map above in small letters saying 自由席. Say you’ve spent a little time in the morning watching some of the low-ranking sumo wrestlers, but you’d like to go out for lunch. What do you do? Well, your ticket is valid for one re-entry. Exit from the main entrance, and turn left. You’ll see the South Gate exit. Indicate to the staff that you’d like to re-enter the stadium at a later time in the day. 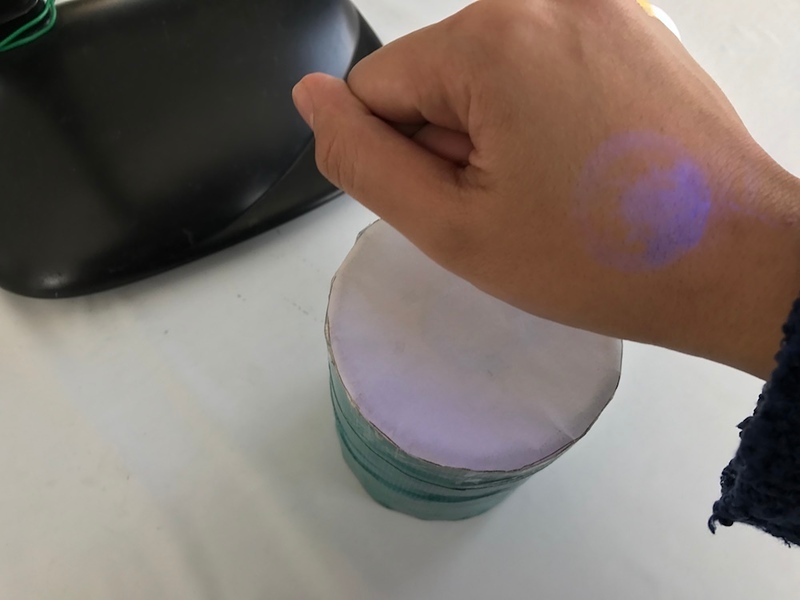 They’ll stamp your hand with indelible ink, which is visible under black light. When you return, come back in using the same entrance. They’ll ask you to hold your hand to the black light, so try not to scrub your hands too hard in the interim.